Momo’s opened last year on Lee Road in the space that I think used to be Golden Dragon. The chef/owner prides himself on using the freshest ingredients and buys his vegetables every day. It is also halal, which adheres to Islamic law. My Muslim friend appreciated this a lot. The quality just shines through. The first time I went I met some friends for dinner. The decor is warm and inviting, with two couch areas with Moroccan seating covered with Moroccan textiles. It invites you to sit and relax with a pot of tea and enjoy some good food. I ordered the mint tea and was completely blown away. It is strong and hot while also being perfectly sweetened (using organic sugar). The tea is extremely refreshing and addictive. A small pot is enough for two, but I could easily drink it by myself. They had no problems refilling it for us either. I ordered the chicken kebab (one piece is missing in the photo because I shared it with my friend before taking the photo). The dinners come with Moroccan bread, salad, basmati rice, and grilled vegetables. The bread is a homemade flatbread. It is an unleavened circle of bread cut in half. It was quite nice. The salad has some mint in the light dressing and chopped up radish, tomato, cucumber, crumbled feta, and black olives. It was not overly dressed and was a nice start to the meal. The kebabs were perfectly grilled and came with a spicy dipping sauce. 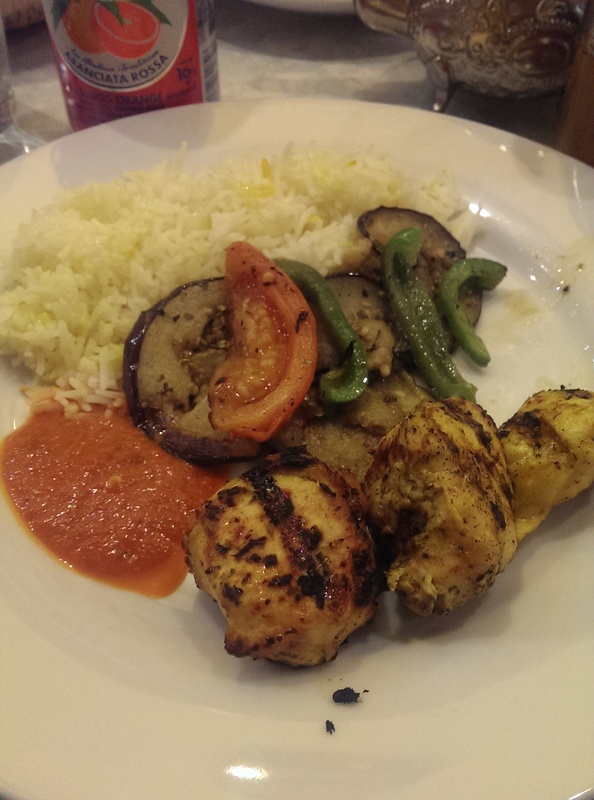 The rice and grilled vegetables were a great complement to the kebabs and were also perfectly cooked. 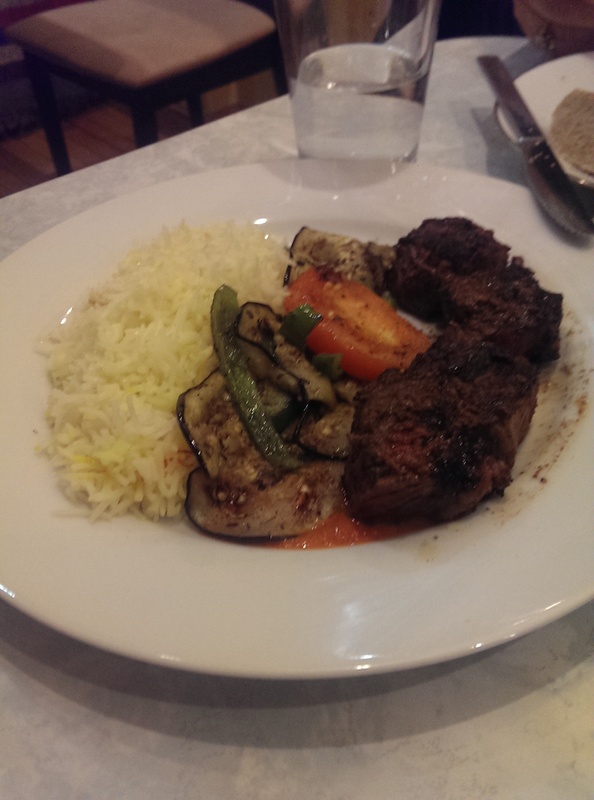 The beef kebabs were just as delicious and just as tender. The chef marinates all the meat overnight, so the marinade tenderizes the meat and then the grill puts on the finishing touch. When I saw that the Saturday special is tagine I knew that I had to come back with my friend who introduced me to tagine. 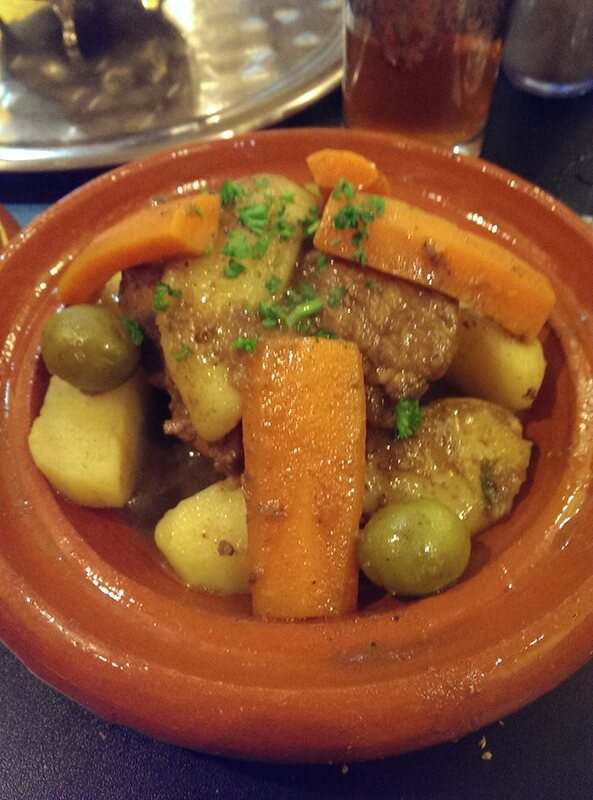 She had made it in her own tagine pot and we ate it with our hands. I remember what a special evening that was and remember how amazingly delicious the tagine was. She makes hers with preserved lemon. The Saturday special is “beef and veg,” which was carrots, potato and olives. It tastes like an amazing beef stew. The meat was tender and fell apart with the fork. The flavor was delicious. The vegetables were also perfectly cooked – not too hard and not too soft. I loved every bite. 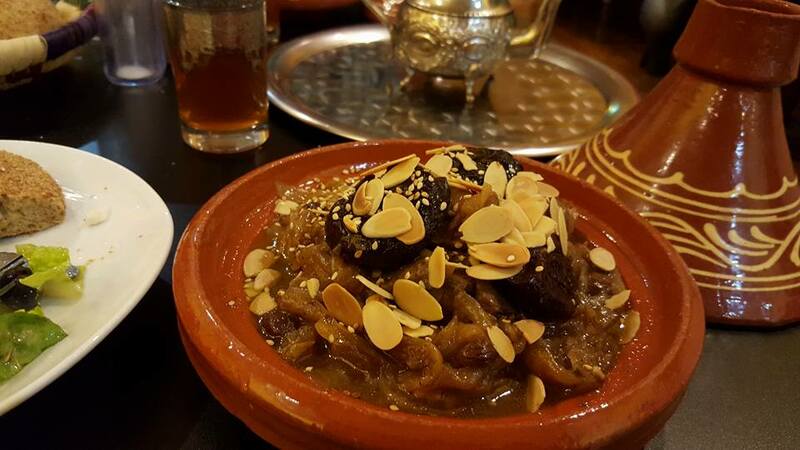 My friend ordered their second tagine of the day – a sweeter tagine with lamb, caramelized onions, stewed prunes, honey, cinnamon, sliced almonds and sesame seeds. She offered me a taste of the lamb, which was amazingly tender and had a delicious sweeter taste. She loved it and said the tea and the tagine brought her back 15 years in time when she and her Moroccan boyfriend drank mint tea and made tagine. She also spoke with the owner about her visits to southern Morocco, while he is from the north. 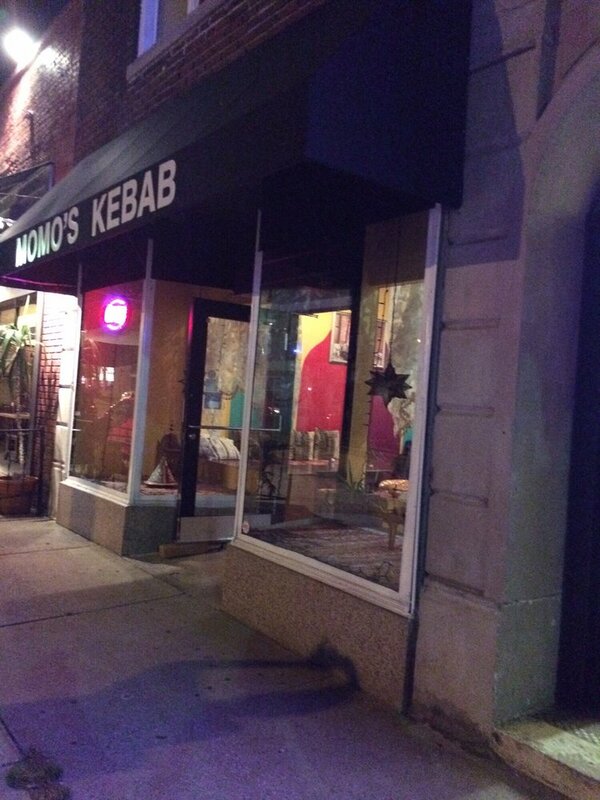 I highly recommend Momo’s Kebab. The food is fresh and delicious – and super-affordable. The chicken kebab was $9, and the beef kebab platter was $9.50. 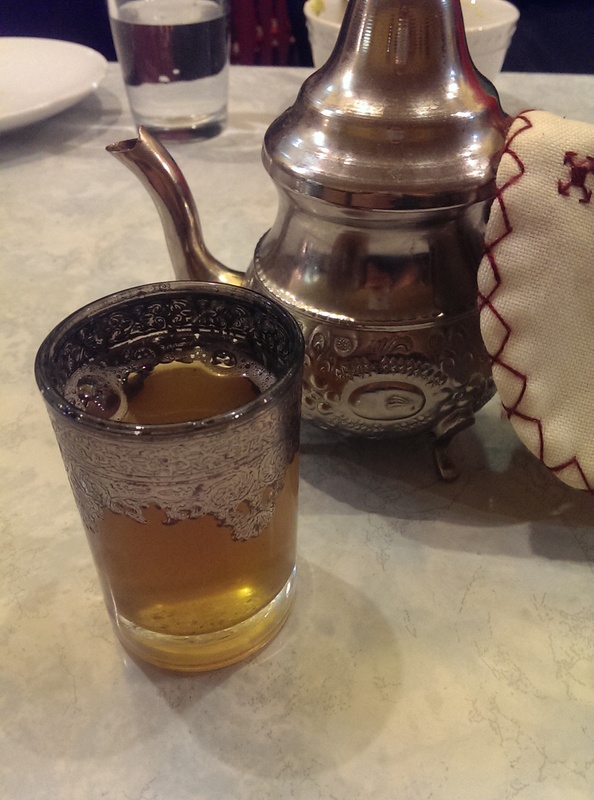 My tagine was $12.50, M’s tagine was $15, and our tea was $5. Not bad for a Saturday night dinner. Word to the wise: they don’t serve alcohol, but that doesn’t bother me a bit. The hours are also extremely generous for a Mom & Pop restaurant. They are open every day from 11 a.m. to midnight except Monday when they are open from 4 to 11 p.m. and Sunday when they close at 11 p.m. too.